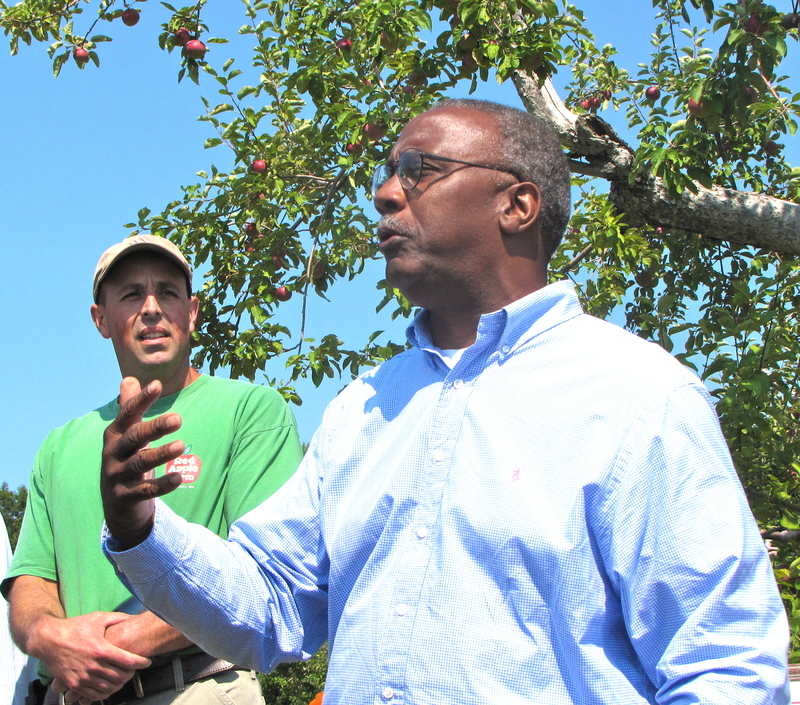 Red Apple Farm turns 100; McIntosh apples ready! 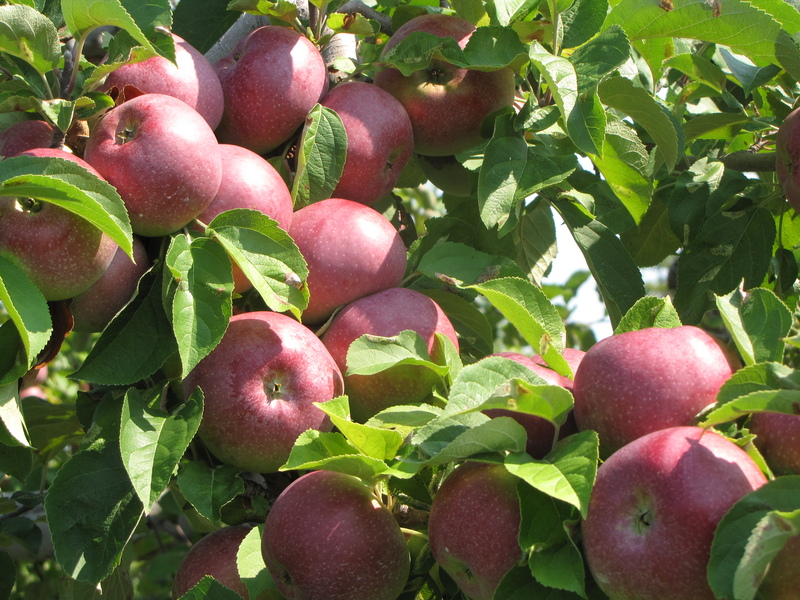 BEAUTIFUL WEATHER, A HOLIDAY WEEKEND, and an early crop make this a perfect time for apple picking. McIntosh, the region’s most popular apple (accounting for about two-thirds of the New England crop), are ready for picking at many orchards, more than a week ahead of schedule. Ginger Gold, Honeycrisp, and Wealthy are some of the other varieties now being harvested at orchards along Massachusetts’ Route 2 corridor, among them Sholan Farms in Leominster, Red Apple Farm in Phillipston, and Pine Hill Orchards in Colrain. Visit New England apples to find the orchard nearest you, and call ahead to see what they are picking. RED APPLE FARM celebrated its 100th anniversary yesterday, August 30. 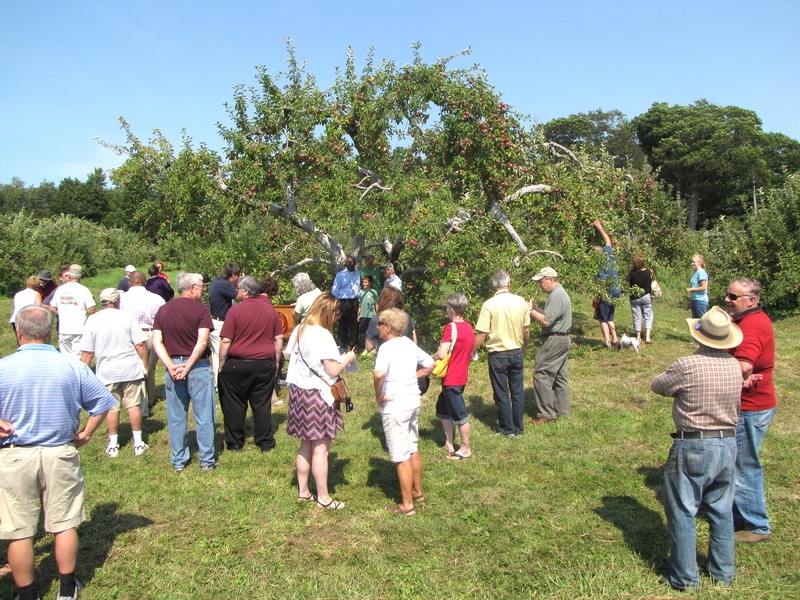 A large crowd gathered beneath the orchard’s century-old McIntosh tree to recognize the Rose family, including Commissioner of Agriculture Greg Watson, State Senator Stephen Brewer (D-Barre) and State Representative Ann Gobi (D-Spencer). Al and Nancy Rose, the third-generation owners of Red Apple Farm, served up apple cake, turnovers, cider donuts, and fresh cider to their guests, accompanied by Al’s father Bill and the next generation: children Aaron, John, Madeline, and Thomas. 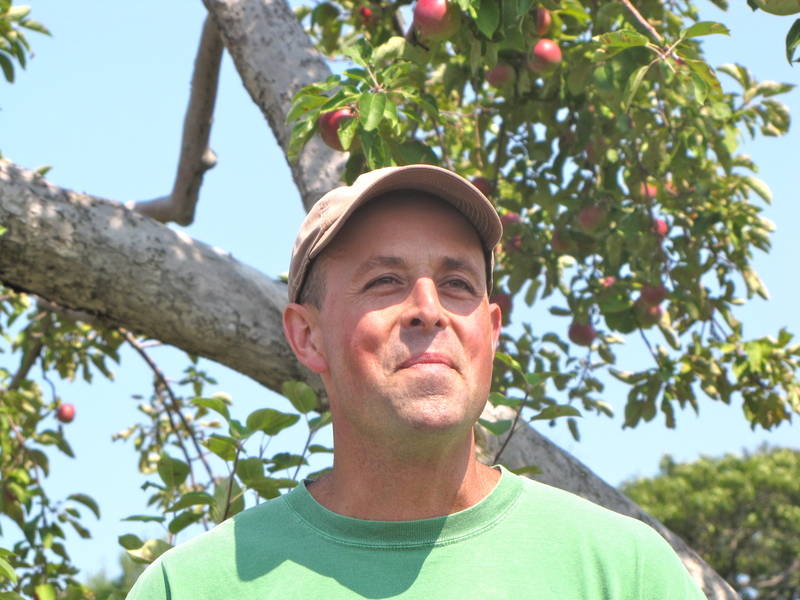 Red Apple Farm has evolved from a strictly wholesale orchard to a thriving retail operation, and like a number of New England orchards (among them Carlson Orchards in Harvard, Massachusetts, and Green Mountain Orchards in Putney, Vermont), Red Apple is going green. A 15-kilowatt windmill towers over the orchard; installed last year, Al Rose expects it to pay for itself within two years. Much of the funding for the wind generator came from the USDA’s Rural Development Program, the Massachusetts Agricultural Environmental Enhancement Program, and the Massachusetts Technology Collaborative. DID YOU KNOW that you can’t grow a McIntosh from a McIntosh seed (or a Honeycrisp from a Honeycrisp seed)? Or that most orchards practice integrated pest management (IPM), a series of low-impact measures to manage pests and disease? Or that John Chapman, aka Johnny Appleseed, never wore the tin-pot hat that appears in many popular depictions of him? 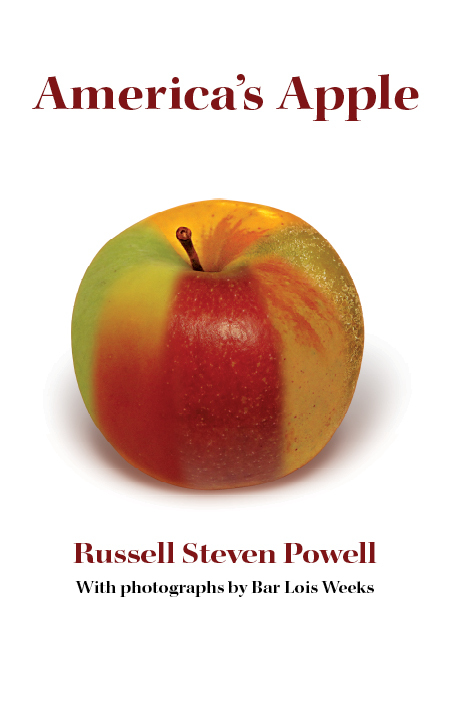 These are just some of the apple facts you can learn in America’s Apple, a new book by Russell Steven Powell. The 250-page book features chapters on food and drink, horticulture, heirlooms, and food safety, including favorite apple recipes and photographs of apples, orchards, and growers from across the country by Bar Lois Weeks. Included is a photographic index of 120 apple varieties grown in the United States. For more information, visit America’s Apple.